This post was written by me through an activation with HireInfluence on behalf of Simply Self Storage. Although I received compensation for participating in the campaign, all thoughts and opinions are my own. Fourteen years ago my husband and I combined two homes as we became a blended family. We made many mistakes in the process but we did some things well. I am going to share with you my how to’s on merging two households and how to do it as seamlessly as possible while taking everyone’s feelings into consideration but encouraging a clutter free home as much as possible. Put their names on the boxes as well so you know whose keep boxes are whose. Trust me! You also want to give everyone a trash bag. As you go through things you will be shocked to see how many things are broken, unrepairable or have missing pieces and can be tossed. Especially as kids go through toys. This is a great way to downsize, essentially, and really encourage your kids to get a handle on being organized. The keep box is obviously the things each kiddo will keep. I do want to say, this might be a hard time for some children. Many kids have a difficult time adjusting to change. They may be resentful. They may be hurting because things like this can be hard. Be mindful of this. I would not tell the kids that they can only keep one box worth of stuff. They already feel hurt from their lives changing and them having no control over it. In most cases they are not getting to pick who their parent falls in love with as they move on. You do not want for your children to feel displaced or like this move and this new home is not theirs. If they want to keep 95% of their stuff, even toys they have outgrown, be gentle with them about it. Give them some time. Do have a conversation with your kids about how rewarding it can be to donate things that we do not use anymore. These things may not be useful to us anymore, or maybe we have outgrown them, etc., but they can be useful for someone else. This can be clothes, games and toys they’ve outgrown, etc. When is the last time I used this or played with this? Is there someone else in the family (younger sibling or new step sibling) who can use this toy/game that I’ve outgrown? Or someone in their extended family who can use it because they have outgrown it. How can I be intentional with this item? If I keep this item will is it still able to serve it’s purpose? Have I used this item in the last month? Did I forget I even had this item? Do we have duplicates of this item? Get rid of duplicates! The undecided box is for things they really want to keep but they know they should get rid of. These are things they are likely emotionally attached to, but have not played with or used in years or months. Remember, we do not want to cause more stress to our kids during this time. If they are undecided about items and you see it is causing them anxiety to decide on keeping or donating, the undecided box is a great option. As a parent, you are going to go through all of your things as well. Those old dishes- are you holding on to them because they are sentimental? Maybe you have a tradition connected to those dishes? Or, maybe you want to donate them because when you merge households you want an uncluttered life and you don’t want three sets of your dishes and two sets of his dishes taking up all of your kitchen space. This leads me to say before all of this packing up starts, you and your new spouse (or new-to-be-spouse) need to sit down and agree on the staples. You know what I mean… main living room furniture pieces, dishes, appliances (like mixers, blenders, washers, dryers, toasters, etc.). You only need one bedroom set for your master bedroom. You don’t need four toasters and you don’t need five different sets of dishes. You two are going to have your donate, keep and undecided boxes as well. Do you each have different decorating styles? Whose decor is making the cut for the new house? Have y’all had a conversation about this? The keep boxes will move with you to the new home. Ensure they are all labeled well so you know where they go at the new house. Kid’s boxes need to have their names on them so the boxes make it to the right bedrooms. Next, let’s tackle the donate boxes. Take a day as a family and address the donate boxes and where they will go. Is there a local shelter, Goodwill store, church, etc., you can take all of these boxes to as a family? How can you make this a family-focused activity that helps kids feel good as they give these items to people who are in need and can use them. Finally we will address those undecided boxes. These boxes have things that grownups or kids are just not ready to part with yet. These are things that maybe you’re only holding on to because you feel sentimental about them. The thought of donating them, selling them or trashing these items gives you anxiety. These undecided boxes are all going to be placed in storage. There are two reasons I would do this. I want you to see you can potentially live without these items and how your love for them is more of an emotional attachment. I want you to experience an uncluttered feeling when you’re combining your homes. 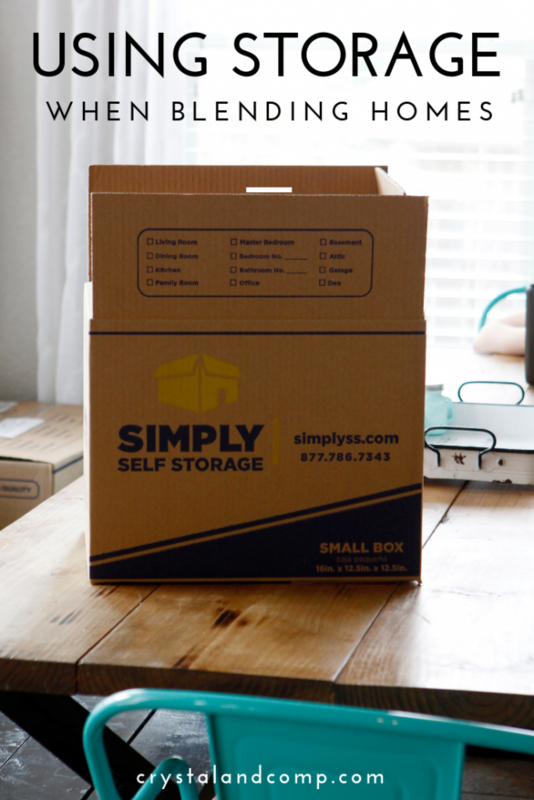 If following my process is something you decide to do, I want you to consider using Simply Self Storage, and here is why. You get your first month free! This is great when you’re on a budget but need space and time for making the merge of households as seamless and stress-free as possible. They also offer climate control space. So, say one of the items you’re storing is the upright piano that you’re undecided about because it is a piece of vintage history, but no one is playing it and it will just take up space in the new house, store it until you decide. (This is seriously something we had to deal with when we merged homes!) Having climate control as an option is such a bonus! Another thing that will bring you piece of mind about Simply Storage is they also have 24/7 camera surveillance. Talk about peace of mind! Now here is the deal, everyone needs to commit to storing as little as possible so you are able to rent the smallest size storage building possible for the shortest length of time. Everyone is going to agree to a time frame and commit to having all things removed from the storage building by that date. Is it three months, six months, etc.? Whatever it is you need an agreed date. Make a family agreement and have everyone sign it. There are also going to be things you hold on to that won’t fit in a box. Maybe that is some pieces of furniture that you’re just not ready to part with yet, but won’t be putting it in your new blended home. These pieces can go into storage as well. Here is what I will tell you. We held on to so many things for too many years that we were both emotionally attached to. It caused so much clutter, stress, and mess in our lives. I want you to really think this through as you fill this storage unit with the items you’re not willing to part with yet. 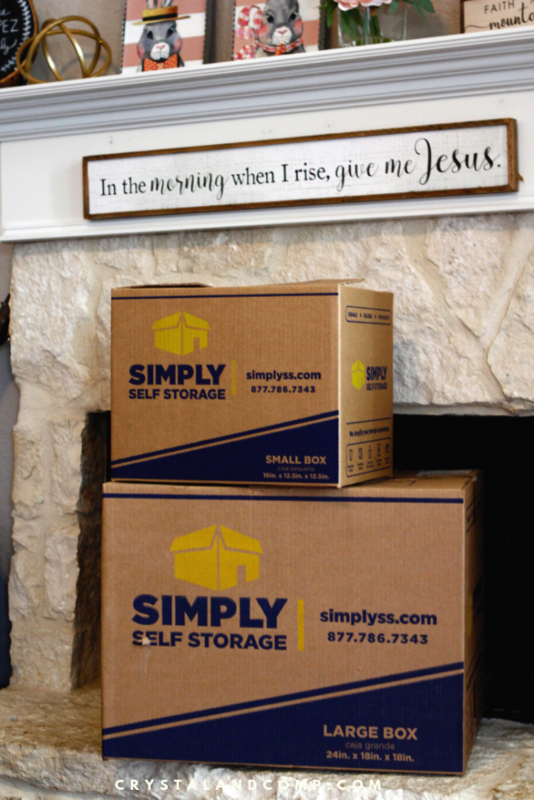 Let’s say you agree to have this storage unit cleared out within 6 month, your family is going to a agree on a day each month where everyone will go and visit the storage group and start to work through the items they personally sent there. Since all children may not have the same visitation schedule this may require multiple trips each month. You CANNOT have the mindset “out of sight out of mind”. You need to stick firm to ensuring everyone visits the storage building once a month and looks through their items to decide if they are ready to either donate items or add items to the blended home (for example their bedroom). What will happen as everyone visits the storage unit and goes through their things each month, they will start to see how easy it was to live without these items. They will begin to acknowledge that they did not even miss the item. They will start to have ideas like “such and such friend could really use this”. Be encouraging and celebrate these moments. Another idea is to allow the children (and yourself) to make money off of the things they are willing to let go of that are in the storage building. For example, if they are willing to part with their unicorn piggy bank, list it in Marketplace on Facebook and sell it for $5. This can be rewarding, wise and a great life lesson. Let them keep the $5 from selling their item. This will encourage deeper consideration for parting with other items. By the end of the agreed time the storage unit needs to be cleared out. This is a blended family effort and honestly can be a great bonding and memory making experience. 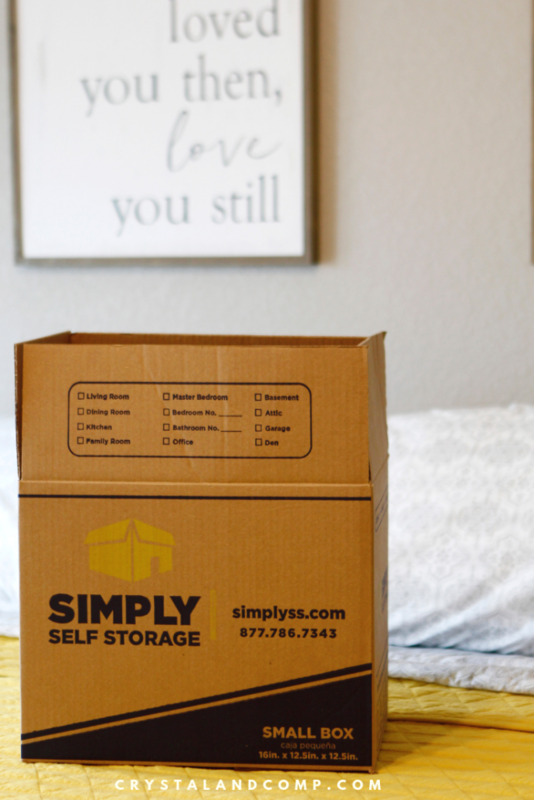 My goal is to help you have a tidy home and a stress-free merging experience and Simply Self Storage can help you do that!